“What is that and how do I eat it?” was the question asked by almost 600 Wesley Chapel Elementary students as they were greeted in the school cafeteria with a Farmer’s Market displaying baskets full of kumquats, strawberries, apples, blood oranges, bok Choy, beets, and other fresh fruits and vegetables. The Food and Nutrition Services Department for Pasco County Schools partnered with Fresh Point Produce and the Kumquat Growers of Dade City to offer students a taste of locally grown Dade City Kumquats and Plant City Strawberries as part of the district’s Farm 2 School Program. 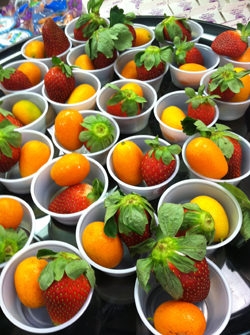 The food service staffed dressed as farmers and handed each student a sample cup containing a fresh kumquat and strawberry. The students’ facial expressions were priceless as they bit into their first kumquat. Many didn’t realize they could eat the skin, so to help reduce the fear of the unknown, food service employees challenged the students to a “let’s do it together” race. Students chanted “Just keep chewing, just keep chewing” as they experienced the inside out sweet and sour taste of fresh kumquats. Students loved the bright red and juicy sweet strawberries, and many enjoyed the unique sweet and sour taste of the fresh kumquats. In February, the Food and Nutrition Services Department will feature fresh Plant City Strawberries on school menus in all Pasco County schools.